Enterprise Vault was one of the first applications to add native support for EMC Centera™ – a popular option for storing archived information. As more customers begin to implement policies to expire data, there’s an accompanying need to change Centera-stored retention items – as Enterprise Vault was used to set the Centera retention period. Changing item retention can create a range of challenges – especially if Centera is in “Governance” mode, or is a Compliance-Plus Model with a need to alter the retention period of the Enterprise Vault Retention Category. At Vault, we’re tackling this problem head-on with an application specifically designed to help Centera users in “Governance” mode. 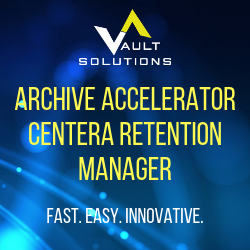 Archive Accelerator Centera Retention Manager leverages the EMC Centera “privileged delete” function to change retention of items already placed on Centera. There’s no need for data to be re-archived or re-indexed – and information isn’t required to be moved on or off Centera. In addition, although the enhanced Retention Manager works with or without the Enterprise Vault Collections feature, companies that have it turned on will see a significant performance gain. The end result is real-world reprocess rates of more than 10 million messages per hour.